Let us begin today’s blog with a simple question – “When asked in a survey, what percentage of people in your country do you think said they are happy?”. No cheating, write the figure down. The answers to this question we show in the graph at the bottom of this blog. You see, you were wrong. You underestimated the happiness figure just as did most of your fellow citizens. 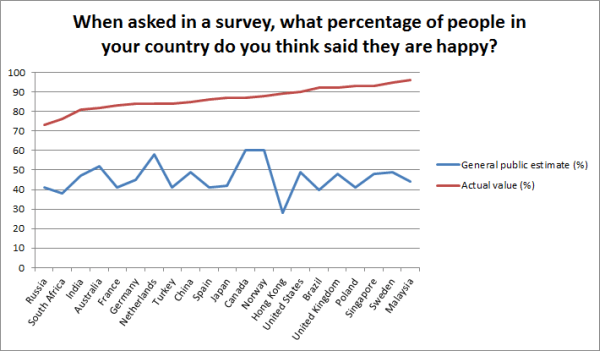 If you are in the UK you probably estimated that just less than 50% of your fellow citizens are happy when in fact more than 90% say that this is the case. These are stats that are echoed in the US with 49% estimating that people are happy when the actual value is 90%. In other words, you and your fellow citizens are very unreliable barometers of the truth. Our intention is not to mock you for being poor at perceiving reality. We too failed to get the right answer. Rather we want to point out that there are some subjects on which the consensus of the general public is pretty poor and could even be misleading. For example, if we were to ask what percentage of our GDP is spent on health each year in our country, the chances are we would say the figure is a much higher figure than reality. In most countries the actual figure spent on health hovers at around 10% to 12% of GDP (in the US it is higher at around 18%) but the general population always over estimates the proportion, guessing that it is somewhere between 20% and 30%. The reason for our interest in this subject is because we have previously been sold on the concept of the wisdom of crowds. The Wisdom Of Crowds is the title of a book written by James Surowiecki in 2004. He picks up on a story reported by Francis Galton, a Victorian statistician who discovered that the crowds at county fairs could accurately guess the weight of an ox when their individual guesses were averaged. As market researchers, we could see the strength of this finding. It means we don’t need to make tricky calculations to assess a market size, we simply need to ask enough people how big they think the market is and, Bob’s your uncle, we have the result! Well this cunning ruse may or may not work. It depends who you ask. If you ask experts, people at the county fair who are used to looking at oxen and who have a good idea as to their weight, you will get an excellent answer – the wisdom of crowds will ring true. However, if you ask people who have no idea about the weight of an ox or indeed how happy people are, or how much is spent on health, you could easily get a bum steer. So this is the point of our blog. We are back to our famous adage about what makes good research – you must ask the right question of the right person. If you ask the right question of just anybody, don’t blame us if you get the wrong answer.